［2］ 工业和信息化部. 5G系统在3 000~5 000 MHz频段内的频率使用规划［EB/OL］. ［2018-12-25］. http：//www.miit.gov.cn/. ［3］ Framework and overall objectives of the future development of IMT for 2020 and beyond［EB/OL］. ［2018-12-25］. http：//www. itu.int. ［6］ GSA Spectrum for 5G：plans，Licenses and trials［EB/OL］. ［2018-12-25］. https：//gsacom.com/. ［7］ Spectrum needs for the terrestrial component of IMT in the frequency range between 24.25 GHz and 86 GHz Table 6［EB/OL］. ［2018-12-25］. http：//www. itu.int. 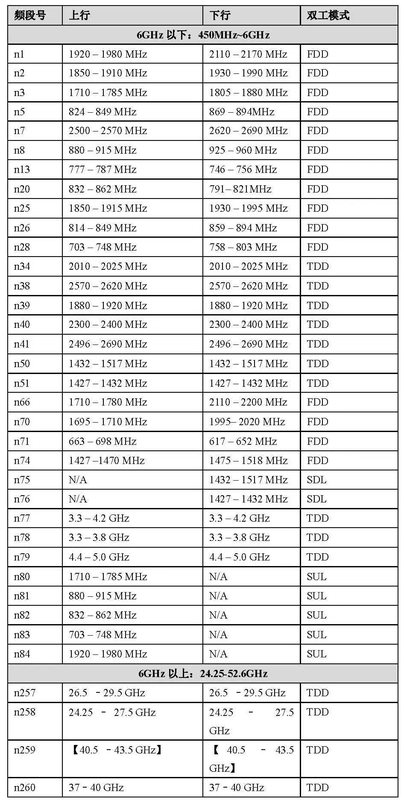 ［8］ General aspects for UE RF for NR（Release 15）：3GPP TR 38.817［S/OL］. ［2018-12-25］. ftp：//3gpp.org/specs.